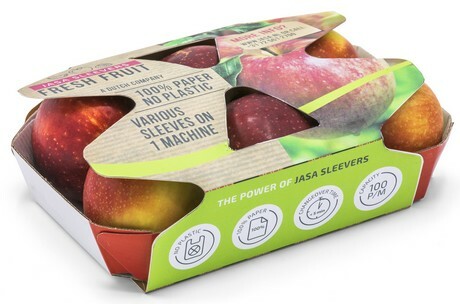 JASA saw an increased demand for sustainable and recyclable packages. They developed a new and 100% recyclable technology to pack apples. The sleeves are made out of 100% recyclable cardboard sleeves and, in most situations, existing trays. The sleeve will replace the film that is currently used to pack apples. With the sleeve, the apples stay visible and are secured in place so they can’t be taken out of their packaging. On top of that, the design of the sleeve comes with a handle, so the package is easy to carry. The sleeves can be used with trays that hold 4 or 6 apples. 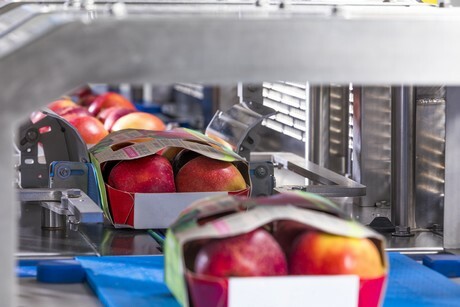 Introduced in 2018, the Sleever was developed on the basis of the user’s wishes and demands: the Sleever processes up to 80 apple trays per minute, has a very short changeover time of less than five minutes, hygienic design and is very easy to operate. The Sleever is a compact plug-and-play machine and can be added to every packaging line. On top of that, the Sleever is energy efficient and has an ROI of less than a year. The new Sleever for apples will be launched at Fruit Logistica in Berlin. You can find JASA from 6-8 February 2019 in Hall 9, Stand D-14.